Ice the size of suitcases crashed down the face in the hot sun. I hunkered below a rock buttress, standing off to the side of 20 Below Zero gully. I had just gotten down off a neighboring route and the sun was increasing in intensity. It was only the middle of November, but I was already climbing classic lines at Lake Willoughby! 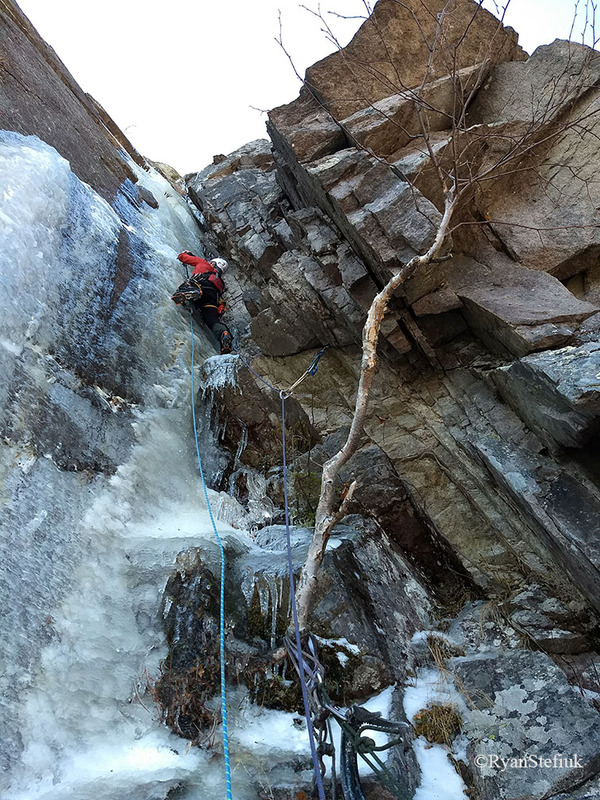 At the same time around the Northeast, fellow climbers were also ecstatically sinking tools into early season classic ice like the Black Dike at Cannon cliff in New Hampshire, Grand Illusion in Vermont’s Smuggler’s Notch, and Chouinard’s Gully at Chapel Pond in the Adirondacks. The ice had formed excitingly fast over the past few days. I stood chewing on a crushed peanut butter sandwich. My crampons scratched on the bare ground. Boom! An acrid smell filled the air as a toaster-sized rock crashed down the slope fifty feet away. It felt more like March than November. Now, right before my eyes, the season seemed to be deteriorating almost as rapidly as it started. I quickly packed my lunch away, grabbed my gear, and hustled through the fallen leaves down to my car. Back at home, a day had gone by. The forecast did not look good. It was clear that the temperatures at lower altitudes meant some of my favorite climbs hadn’t stuck around. 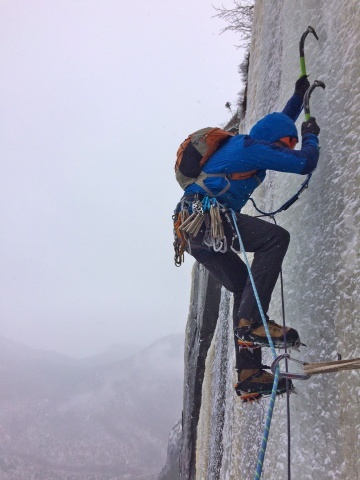 I was given an amazing early taste of winter and was depressed at the thought of having to go back to merely dreaming of steep ice. I fired up the wood stove and sunk into my couch, aimlessly browsing social media. Trump, ‘snowflakes,’ North Korea, gun control, blah, blah, blah. None of it seemed to matter. 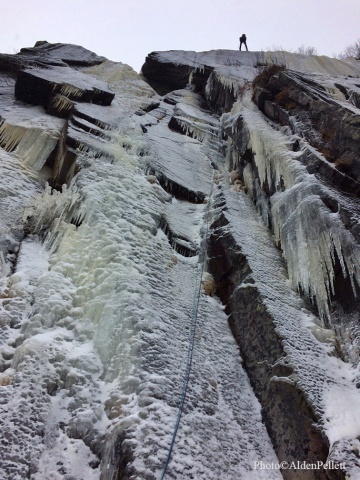 I wanted my ice climbing back, and my out-of-shape, old-man calf muscles from the past couple of days climbing weren’t helping me forget it. Suddenly a glimmer of hope flashed across my computer screen. A Canadian friend to the north posted photos from his own weekend outing. The big crags in the background of some of his pictures had long runnels of shaded ice snaking over five hundred feet down the faces. 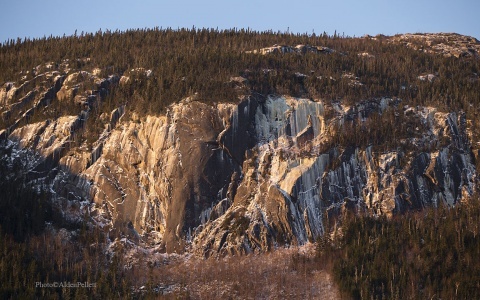 In another image, steep yellow ice flowed several hundred feet down to talus and trees. I had seen these classics in the ice guidebook for Quebec, but would the ice still be there? Smiling faces in his warm, sunlit photos told me, ‘No,’ but hope flickered there. I checked the forecast. I sent a message. I read the guidebook. I sent another message. I got up and put another log on the fire and sat forward on the couch. His answer came. It was “Yes!” The climbs should still be there! My fingers working quickly, I sent one more message and my buddy Ryan replied. He had time off too and was game for heading north. We would escape this warm up by driving north of the border. 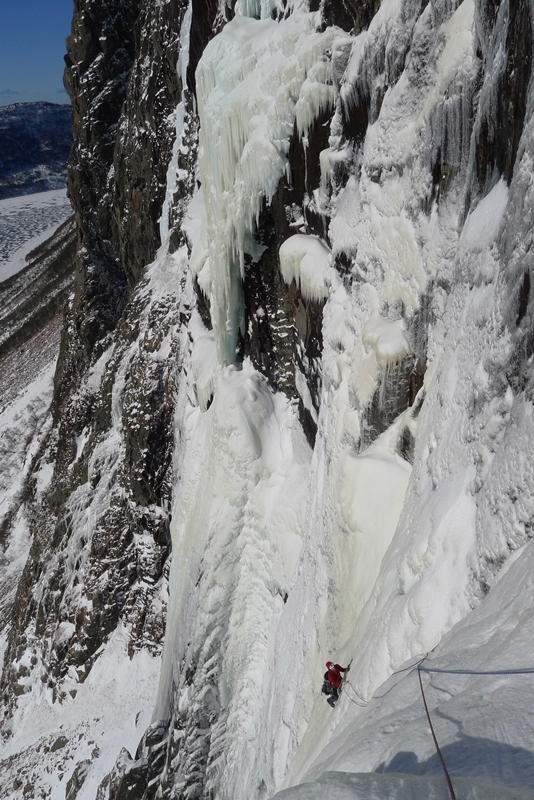 Ryan Stefiuk steps lightly on the brook crossing to reach Mont Gros Bras (Big Arm) in Quebec. The Parc National des Grand Jardins (Great Gardens) lies about an hour north of Quebec City, traveling through farm country to the quaint tidy town of Ste.-Urbain. This 120-square mile park is loaded with boreal forest, wildlife, tundra, and scenic granite faces. Wednesday morning, the alarm goes off at our Motel in Baie St. Paul. Ryan fires up the Jet Boil to make hot tea for the day ahead. We had arrived at 9 p.m. the night before, spending an hour sharpening tools and prepping gear before hitting the hay. After wolfing down a speedy breakfast at the ubiquitous Tim Horton’s, we were chomping at the bit to hit the park and see if our chosen routes were still in. I point my old green Toyota van out Highway 138 and start out of the valley. Farms like patchwork dot the way. Dairy cows line up for morning milking, standing in a green hillside pasture grooved from decades of this daily ritual. Passing through the tidy town of St. Urbain, we take a left on 381, winding uphill toward the park. Encouragingly, the early light of day reflects off small ice flows in the hillsides. Straight ahead, our goal, the beautiful granite dome of Mont Gros Bras, ‘The Big Arm,’ comes into sight. Easily viewable from the highway, I slow down, and Ryan cranes his neck to look at the big face. It was Game On! Now all we had to do was see if we dared climb the thinly iced corners. You reach the start of the classic mixed routes on Mont Gros Bras by taking a trail across the road and slightly downhill from the Visitor’s Center. Microspikes are helpful right now for crossing the brook and walking uphill on the frozen, leaf-strewn path. The approach seems like it will take longer from the parking lot, but just ten to fifteen minutes of hiking should take you below the big corners and mixed lines there. Ryan Stefiuk leading up pitch 1 of P’tite Tête, WI4+R,M6R, on Mont Gros Bras in Parc National des Grand Jardins in Quebec.. Thanks to thin ice, we found the guidebook rating was harder than the actual conditions we encountered. Easy mixed and thin ice at 4+R. Photo by Alden Pellett. “Gaston et mademoiselle Jeanne,” WI4,M5R. 180M. Just to the right of the previous route. “All Fine,” WI4+,M5R. 180M. This is the left-hand side of these obvious corner systems in the central part of the cliff. “Hals und Beinbruch,” M6+. 230M. Approach: Cross the road next to a yellow ‘500M’ truck sign, and look for orange contractor tape marking a route through the woods, crossing the brook, and then trending up the right of the talus field below the main cliff face. The woods above get fairly dense and steeper the closer to the cliff you get. This appears to be the easiest path to and from the cliff face. Trust me, we didn’t come down that way and it was a nasty bushwhack. 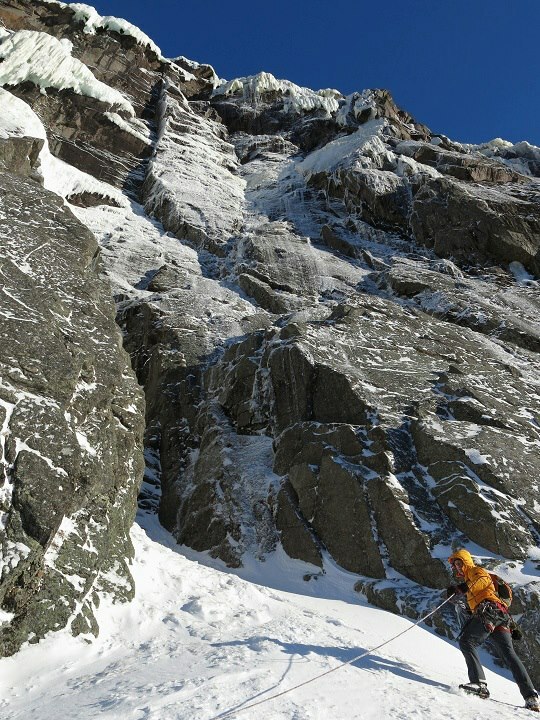 There are a number of appealing corners of thin ice, turf, and mixed corners that have been climbed to the right of this route. Alden Pellett leads up pitch 2 of the mixed route, “P’tite Tête,” on Mont Gros Bras in Parc National des Grand Jardins in Quebec. 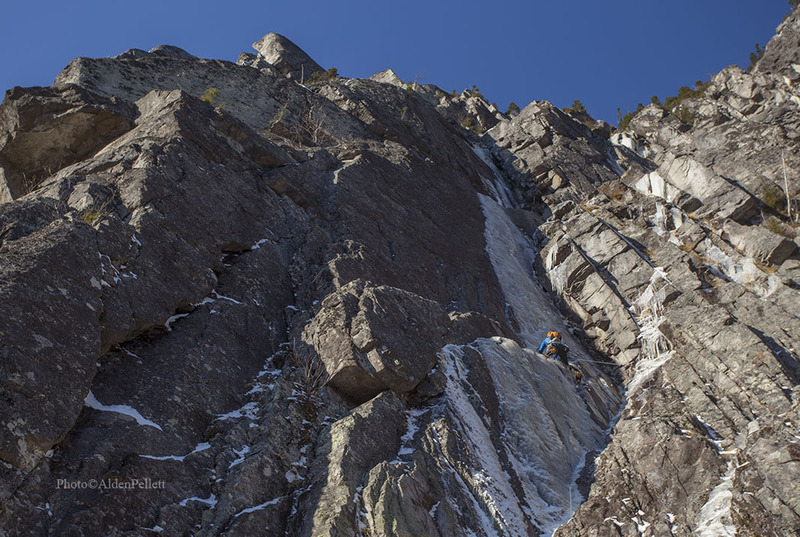 Ryan Stefiuk heads up the crux headwall on “Retour des Crapauds”(Return of the Toads) on the Mur des Crapauds Wall. 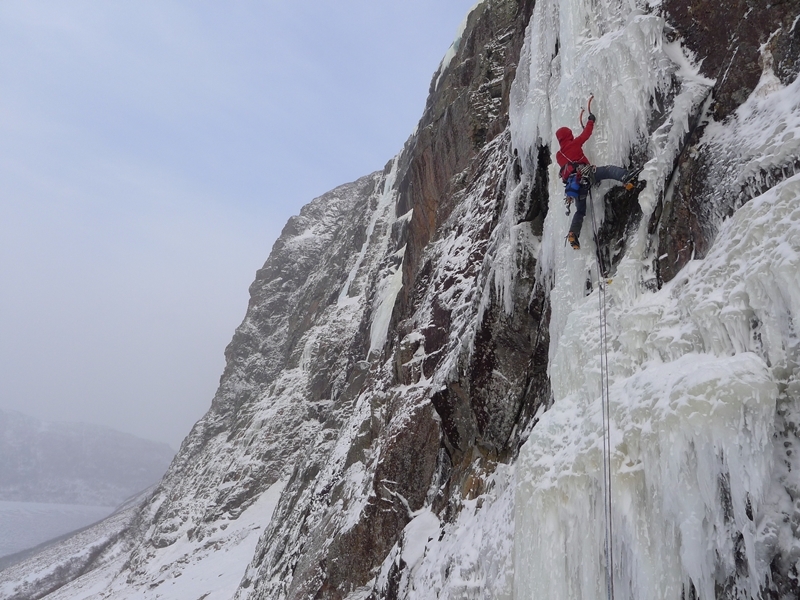 Pitch one of the ice climb “Retour des Crapauds.” in Parc National des Grand Jardins. It gets a WI5+R in the guidebook. We found conditions much easier, more like WI4+(WI4R). There are places for lodging in St. Urbain but we chose to stay near the bigger town of Baie St. Paul for a better selection of restaurants and services. You can spend between $75 to over $156CDN per night. Hotel des Cascades – Offers what is probably the most inexpensive night’s lodging. No frills but clean and right near downtown. Recently redone rooms. Hotel Baie St. Paul – Much along the same vein as des Cascades. Inexpensive but fairly clean and near enough to downtown. Hotel and Spa Le Germain Charlevoix – Pricey, but pretty inclusive. Restaurants onsite and more. Tim Hortons for a quick breakfast, of course. it is just down the main drag in town. There is a McDonalds, too. Check out a few of the local restaurants if you have time for a sit-down breakfast. There are a number of very nice eateries along the Rue Ste. Jean Baptiste in town like Le Cafe des Artistes. Check them out! https://www.neice.com/wp-content/uploads/2017/11/neice_murdescrapaud_websize.jpg 721 1152 Alden https://www.neice.com/wp-content/uploads/2017/10/2012_NEice_logo_oval_blk6-1024x350-300x103.png Alden2017-11-17 23:32:282017-11-24 20:37:13Go North, Old Man!